Rafael I. Hwang's Egg Minder makes you think, “Wait, how do I not own this already?” Isn't that also what you want to hear from your giftees this holiday season as they open your presents? 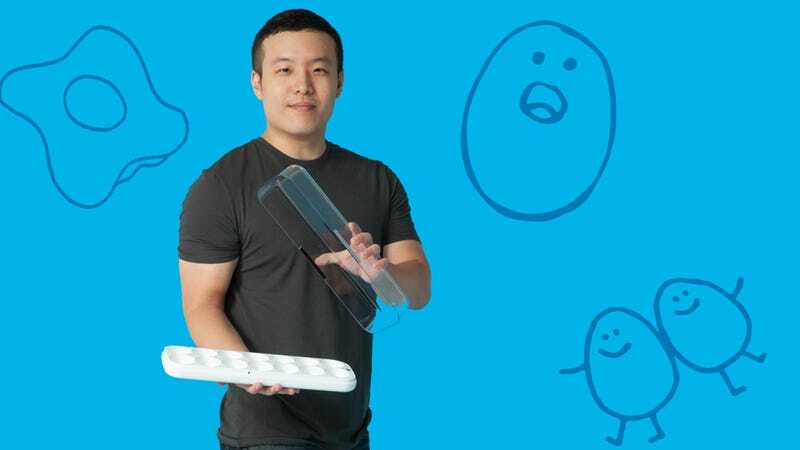 Through the proven creative process of community input, Quirky helps people like Rafael invent products that solve problems and simplify everyday tasks. Not surprisingly, Quirky creations also make ideal presents. After learning about Rafael’s experience as a Quirky inventor and the inspiration behind the Egg Minder, we knew he’d be a perfect curator for a holiday gift guide. The Egg Minder solves a problem anyone who spends time in the kitchen will encounter: finding yourself staring at a carton of eggs with absolutely no idea which ones are rotten. With the help of Quirky, Rafael invented an egg carton that syncs with Wink, an iOS and Android app. Wink shows you how many eggs are in your Egg Minder, and when each of them will go from delicious to dangerous. Rafael knows how to create a must-have item, so we asked him to share his inventive brain for your holiday shopping needs. He provided the following list of novel gift ideas that have come out of the Quirky community. The days of family and friends faking glee is officially over! Have more than four people on your list? (The answer to this should be yes.) Head here to learn more about these and other Quirky products that can easily transform from an imaginative invention to an inspired gift.